What Would Joe And Eugene McCarthy Drive? It is not uncommon for people to mistake former Senator Joe McCarthy for former Senator Eugene McCarthy, despite the fact that they represented approximately opposite points of view. 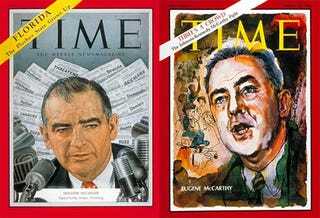 Eugene McCarthy was the super liberal Democrat from Minnesota who was succeeded by the equally liberal Hubert Humphrey. He ran against sitting president Lyndon Johnson in 1968 purely on an anti-war platform, something you're not supposed to do, but lived to carry on the liberal charge until his 89th year of life. Joe McCarthy represented neighboring Wisconsin and was, relatively speaking, a touch more conservative. Though moderate on some issues, McCarthy lead the fight against the great Communist conspiracy that quickly spread from possible subversives to pretty much anyone he could find. He took on Eisenhower, a member of his own party, and died not too long after of alcoholism. We know their politics, we think we know their souls, but do we know what they'd drive? Assuming they have Highlander-esque immortality, what would the red-baiter and the war-hater drive? We're looking for real insight here, not just "Hummer/Prius."